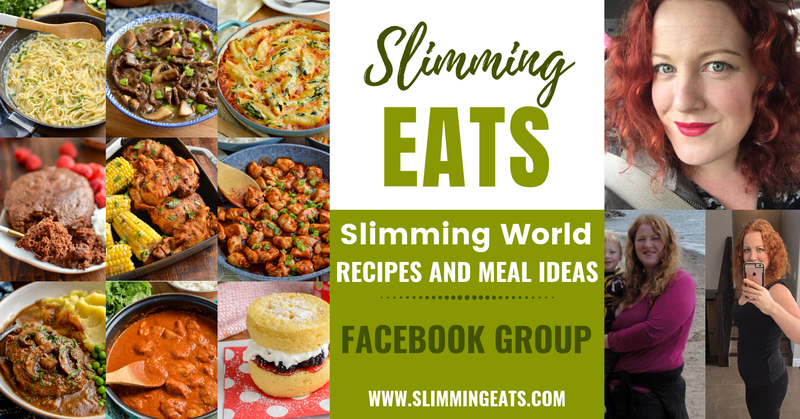 Oh yes this really is a Slimming World friendly Creamy Tomato Pasta Sauce, packed with speed foods and totally delicious!! 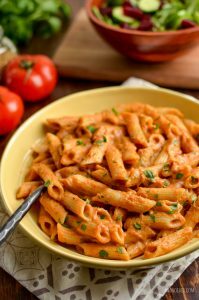 If you love pasta, then you have to try this delicious Creamy Tomato Pasta Sauce, it takes a basic Tomato Pasta sauce to a whole other level. Double or even triple up the recipe and you will have plenty left for freezing too. Bonus!! Years ago pasta for me would involve opening a jar of sauce and dumping the contents into the pan. I seriously can not remember the last time I used a jar sauce. I always make my own as it really is simple and pretty quick to do, plus it’s so easy to sneak in some hidden vegetables if you have fussy ones in your house. It’s a great sauce for adults and kids. This delicious Creamy Tomato Pasta Sauce comes packed with speed vegetables like onions, tomatoes, zucchini (courgette) and eggplant (aubergine). I love eggplant, it is such an underrated vegetable but is amazing in sauces like this. It gives a lovely flavour to the sauce too. 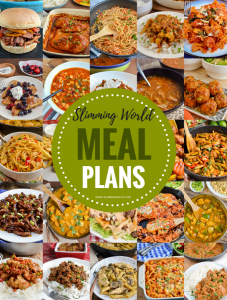 or you can also head on over to my FULL RECIPE INDEX with over 700+ delicious healthy Slimming World Recipes. For the creaminess to the sauce I use low fat cream cheese (like Philadelphia), it’s low enough in syns to syn a serving and saves your healthy extra A for elsewhere in the day. Think of those cups of tea or coffee. The spiralizer I own is called a Paderno 4-Blade Spiralizer. It is one of the higher rated ones out there. I’ve had other ones that just didn’t cut it, this is sturdy enough to spiral even the hardest of vegetables like sweet potato and swede (rutabaga). There are small handheld ones you can get too, but they will only spial stick shaped vegetables like carrots or zucchini, so you are pretty limited to what vegetables you can make interesting. 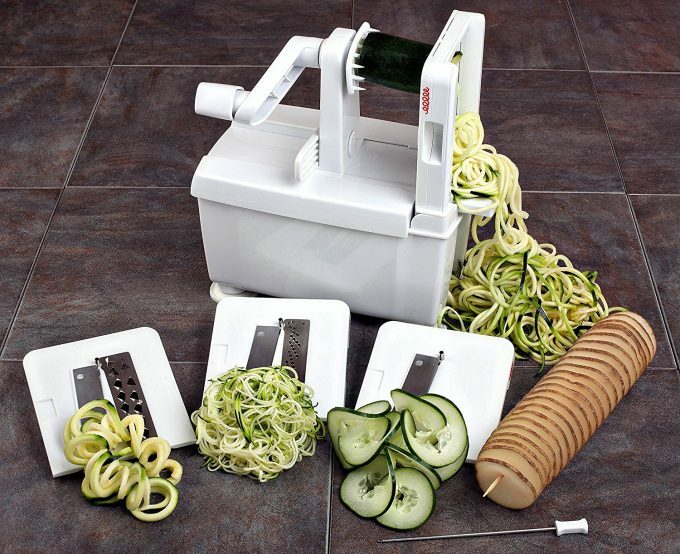 If you are going to invest in a spiralizer I do recommend one like this. 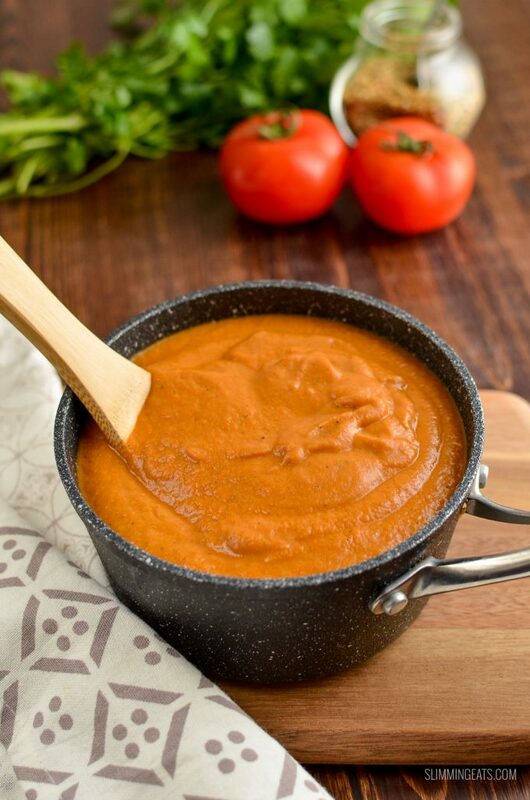 This delicious Creamy Tomato Pasta Sauce can also be kept gluten free by chosing a gluten free pasta and If you don’t fancy pasta, this sauce is also great served with chicken and your choice of sides. I love it spooned over a grilled chicken breast, served with some rice or potatoes and vegetables – yum!! 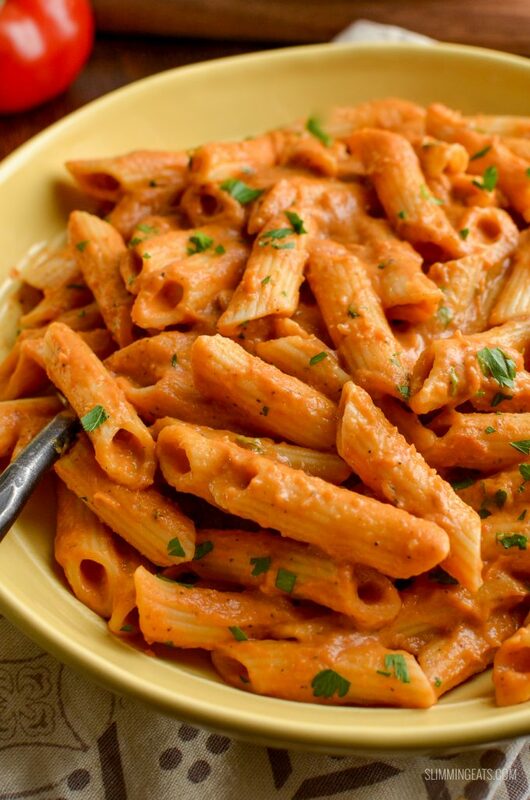 HOW CAN I ADD A 1/3 SPEED FOODS TO THIS CREAMY TOMATO PASTA SAUCE? There is already plenty of speed vegetables in this sauce, but you can increase them even further by pairing with a mixed side salad. I love baby greens, cucumber and beetroot or some additional side vegetables of your choice would also go really well with this sauce, especially if serving it over chicken. 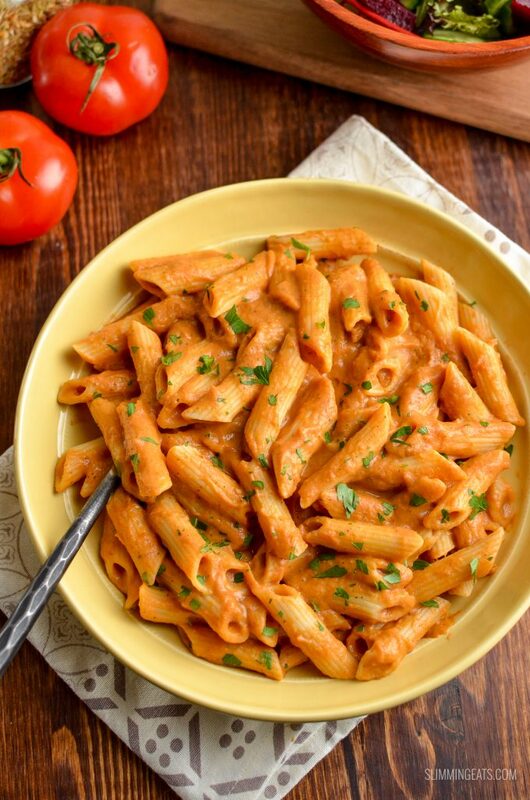 WHAT KITCHEN ITEMS DO I NEED TO MAKE THIS CREAMY TOMATO PASTA SAUCE? Place a non stick frying pan over a medium heat, spray with some cooking oil spray. Add, the onion and garlic and fry until softened. Approx 5 mins. Add the tomatoes and cook for a few minutes just till they start to break down into a sauce.Add the zucchini, eggplant, tomato paste, mixed herbs and the stock. Bring to the boil, reduce heat, then cover and simmer for 30 mins.Add to a blender and blend till smooth. Add back into the pan along with the cream cheese and stir until it melts into the sauce making it nice and creamy. If the sauce becomes too thick, you can add a little more stock or water. If you want to freeze some of this sauce, I recommend doubling or tripling up the recipe to make a larger quantity. Why not use quark? Same as the low fat soft cheese and no syns. 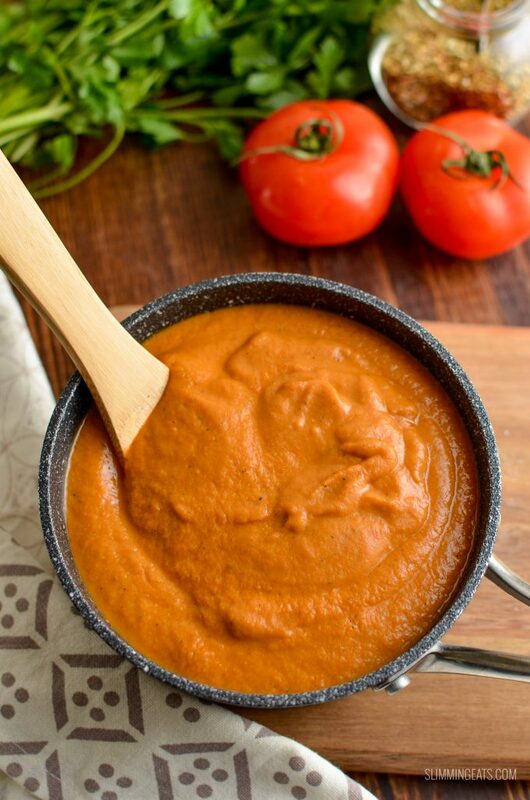 I use it in other similar type sauce dishes and it does the job just as well! You can use quark if you prefer and want to keep this syn free, however it isn’t exactly the same as cream cheese, quark has a slight sour tang to it, where as the cream cheese is more creamy. Yes the sauce will freeze fine. You may need to a add a little stock when reheating if it is too thick. Great recipe – soon to become (another) favourite! Stupid question but did you peel the aubergine and the courgette before putting them on the pan? Another wonderful recipe. Thanks for all your inspiration your recipes are the best. This was delicious. Can I make it and freeze it? Hi Pauline, I often freeze this and it’s fine. Enjoy! !